Home » Life Hacks » Consumer Affairs » Debt Collectors Are Calling My Family — Now What? It's bad enough when debt collectors start calling you, but what if they start hounding your family members, too? Can collection agencies legally do this? The answer is a bit complicated. Debt collectors are hired to get you to pay up the money you owe to their clients. To do this, they'll reach out to you by mail or phone to convince you to come up with the cash. But if debt collectors can't find you? Then they can contact your family members. In fact, they can contact anyone who knows you, including friends or co-workers. However, what they can say to these third parties, and how often they can contact them, is extremely limited. The Fair Debt Collections Practices Act states that debt collectors can only contact family members, friends, or co-workers to find your location. If they have already contacted you, they are not allowed to reach out to others. They can also only contact family members or friends once. Debt collectors are also limited in what they can say to your family members. They must identify themselves and state that they are confirming your contact information or looking for correct contact information. If your family members ask, they are required to identify who is employing them, but only if they are expressly asked this question. Debt collectors are not allowed to tell family members that you owe any debt. 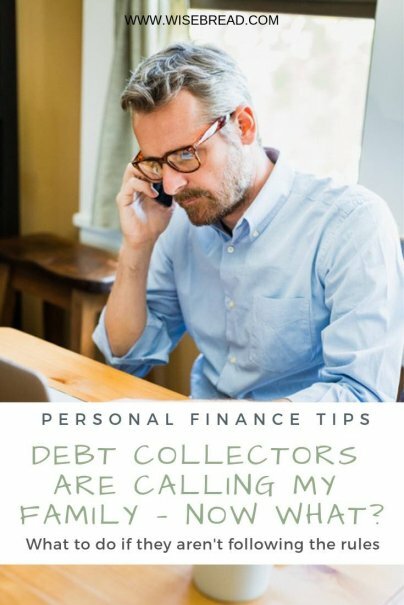 Collectors also can't threaten family members or call them more than once unless the debt collector reasonably believes that the family member's earlier responses were incorrect or incomplete, and that the person now has correct or complete info. The Consumer Financial Protection Bureau says that debt collectors can't discuss your debt with anyone besides you, your spouse, or your attorney — if that attorney is representing you regarding your debt. If you're a minor, debt collectors can speak with your parents about your debt. They can also discuss your debt with your guardian, executor, or administrator, if you have them. What to do if debt collectors aren't following the rules? If debt collectors are violating the rules of the Fair Debt Collection Practices Act when they contact your family members, you should contact the Federal Trade Commission with your complaint. You can file a complaint online by using the commission's Complaint Assistant. You can also contact the Consumer Financial Protection Bureau. You can file a complaint online with this this agency, too.